﻿﻿Gracie is very amazing! She lives with her Guardian family who describes her as loyal, loving, playful, gentle, sweet, content, calm and obedient! She will sit at your feet for hours or keep up with you at the park! Gracie's nickname is "curious Georgina" since she is so interested in everything you do! Gracie is a Multi-Generational Australian Labradoodle. Her fleece coat is a soft cream with apricot markings. Ginger is such a wonderful addition to our program! She lives with her Guardian family which includes children and her fur baby friends. ​Ginger is super sweet to everyone she meets and is a wonderful companion! Ginger is a Multi-Generational Australian Labradoodle. Her coat is a soft apricot-red fleece. Honey is as sweet as her name suggests!! She lives with her Guardian family which includes two boys and Tails of the West's Amazing Grace (from above). Honey is playful and everyone's best friend! Honey is a Multi-Generational Australian Labradoodle. Her coat is a soft apricot-red fleece. Health Clearances: Hips-OFA Fair, Elbows-OFA Negative, CERF-normal, PRA-Clear by parentage. ​Bella is our sweet and sassy girl! She loves to play in the park with her ball. Bella lives with her Guardian family in North Scottsdale and absolutely loves her daily walks. Bella is a Multi-Generational Australian Labradoodle. Her coat is a soft black fleece that makes you think of a velvet painting. Josey makes us laugh! She is such a happy girl and welcomes everyone that visits her home! She can jump very high and will be a great agility dog one day! Josey lives with her Guardian family in North Phoenix. (She is also on our home page next to the cactus). Josey is a Multi-Generational Australian Labradoodle. Her coat is a soft apricot-red fleece. Punkin is a sweet, playful girl that loves her Guardian family which includes her fur-sisters Ellie and Lucky as well as two human sisters! She's always happy, whether playing non-stop for hours or kicking back and cuddling with her girls. 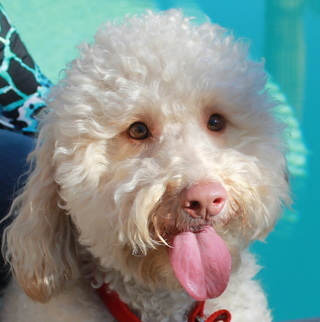 Punkin is a Multi-Generational Australian Labradoodle. Her coat is a soft cream fleece. Cozi is such a joy and cuddly girl that loves her Guardian family which includes her Papillon siblings! She always has a smile on her face and loves making everyone happy! Cosette is a Multi-Generational Australian Labradoodle. Her coat is a soft cream/light apricot fleece. Our sweet Sophie is such a loving girl who loves to play with her friends but her first love is her Guardian family which includes her human siblings! Sophie is a Multi-Generational Australian Labradoodle. Her coat is a soft cream/light apricot fleece. Our Miss Harley Rae is super sweet, loving and playful and loves to cuddle! She plays with her best friend Sedona, 24/7 ! Harley lives with us in our home. ​Harley's parents are Honey and Wyatt. Harley is a Multi-Generational Australian Labradoodle. Her coat is a soft curly caramel wool/fleece. This is our new caramel Parti girl, Miss Sedona Blaze! Sedona is full of personality and lives up to her parti persona and simply loves life! Her best friend is Harley Rae (picture above). Wherever Harley is, there is Sedona! She lives with us in our home. ​Sedona's parents are Story's Apache Warrior "Chase" and Ladd Hill's Peppermint "Padi". Sedona is a Multi-Generational Australian Labradoodle. Her coat is a soft curly caramel and white fleece. Jack is a very mellow fellow who goes with the flow. He is eager to make everyone happy but content to lay by your side and soak in your presence. I cannot say enough about how beautiful he is. Thank you Yvette Vinton from Vinton Valley Labradoodles for our gorgeous boy! Size: 17” and 26 lbs. Full of life and loves living with his family and best friend Piper in Cave Creek, Arizona. He's an excellent swimmer and has beautiful hazel eyes. 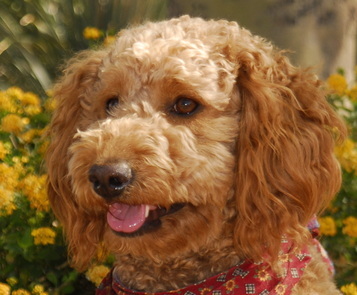 Wyatt is a Multi-Generational Australian Labradoodle who has a carmel/cream colored fleece coat. Gus is Abbey's son and Zoey's brother. He is a beautiful red boy who lives with his brother and human family in Fountain Hills! Gus is a sweet and playful boy. Gus is a Multi-Generational Australian Labradoodle who has a RED colored fleece coat. Size: 20" and 47 lbs. Duke started his career in the spring of 2018. Thank you Spring Creek for our beautiful new stud! He is one of those dogs that you want to hang out with all the time! Duke is fun and playful and is always happy! Duke lives with a lovely Guardian family with his Lab fur-friend and 3 human sisters who he absolutely adores! Duke is a Multi-Generational Australian Labradoodle who has an apricot colored fleece coat. Size: 18" and 30 lbs. Bailey is a Multi-Generational Australian Labradoodle. Her coat is a soft apricot-red fleece. Nala lives with her forever family in Cave Creek, Arizona. 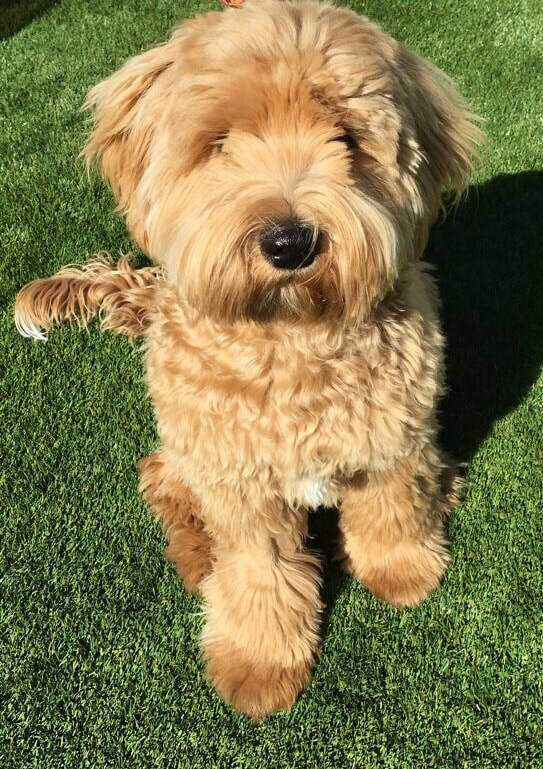 ​Nala came to us from Ellsworth Labradoodles In Utah. Thank you, JoAn!! Our Gentleman Jack is her father. She is a sweet girl who loves her family in Cave Creek, AZ. Nala lives every day to the fullest and enjoys her human sister, Lindsey! Nala is a Multi-Generational Australian Labradoodle. Her coat is a soft cream fleece. Abbey is retired and lives with us in our home. She was the wonderful mother of 5 beautiful litters! She is such a character and makes us laugh all the time. Abbey "talks" alot---she is trying to tell us something! She has chosen Hannah as her Human and she LOVES small children. She is a Multi-Generational Australian Labradoodle. Maddie is now retired and remains with us in our Peoria home. She has successfully had 4 litters and has given many families a lot of happiness with their new puppies! Molly was a wonderful surprise for us. She has carmel colored, beautiful soft fleece coat, with bright green eyes. Her personality matches her unique looks. She has a lot to say and she loves to play, At the same time, she loves to be loved and is very laid back. Molly has joined our first Guardian Family, Matt and Heather along with their daughters, Beverly and Rosy. Congratulations! Cute as a lamb. With beautiful hazel eyes. She and Cinder are sisters born to Maddie on February 18, 2011. She is a Multi-Generational Australian Labradoodle. She has a cream colored fleece coat. Suki lives with her Guardian Family in Mesa, Arizona. ​ZOEY is our lovable, playful, full of joy big girl! She is the perfect mix of her parents….. a little bit "Snuffleupagus" like her daddy and a sweetheart like her mommy. She has retired with us in Peoria. Zoey is a Multi-Generational Australian Labradoodle. Her coat is a soft apricot fleece. Our dear family member Hershey passed away on February 20, 2013. We can only say that our hearts are broken and our lives will never be the same without this fantastic friend. Hershey understood everything you would tell her, she would smile at you as you came thru the door, she would show every emotion a human would and she was the sole reason we started this business. Her personality, wit, loyalty and love for us will never be matched! We are so blessed to have had this spectacular dog as part of our family for the past 7 years. Thank you to those of you that knew and loved her!